What's the used Audi A5 coupe like? It’s perhaps not surprising that when the time came for Audi to update its highly successful A5 Coupe in 2016, it didn’t muck around with the formula that had worked so well for the original car. Certainly the new car is lighter and a little bigger, so has more space in the interior and the boot, but all the important bits seemed to be pretty much as before. Chief among these similarities is the sporty and elegant design, which is the key factor that separates the A5 Coupe from the four-door executive saloon A4, with which it shares much of its underpinnings. 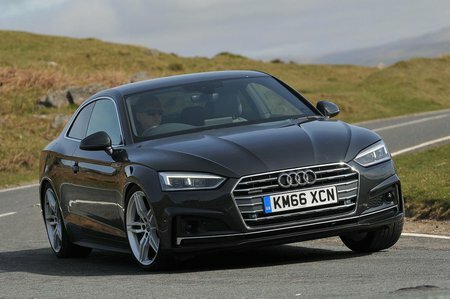 In fact, the latest A5 Coupe now rides on an all-new platform, and it feels much the better for it. The ride is firmer than the equivalent A4’s, depending on which of the various trims you’ve chosen, although it is supple enough to take the sting out of larger bumps and ripples. And the handling is precise, if not truly agile or ever particularly involving for a keen driver. There are a number of engine options, and all are smooth and punchy. You can have a 1.4-litre TFSI petrol unit at one end, and a rip-snorting super-sporty 3.0-litre S5 version at the other, that can see off the 0 to 62mph sprint in just 4.7secs. In between are a number of diesels that offer a good compromise between enticing performance and reasonable efficiency, and there is also, in certain engine and trim combinations, the option of four-wheel drive, which offers improved grip in slippery conditions. The A5 Coupe doesn’t disappoint inside, pipping the cabin quality of its German rivals with upmarket materials everywhere you look and touch. True, the design of the interior perhaps lacks the flair and imagination of a Mercedes-Benz C-Class Coupé, but the flipside is a better-structured, more logical dashboard layout. Audi’s MMI infotainment system comes as standard and features a clear 7.0in display mounted centrally on the dashboard and controlled with the usual rotary dial between the front seats. All in all, the A5 Coupe is an extremely well-rounded package that deserves serious consideration, especially if you can pick up a good used version. It might not have the driver involvement of the BMW 4 Series Coupe, but it’s a quick and refined and beautifully put-together car with much visual appeal.